We are pleased to announce the beta release of the new IMF Tune version. There is enough new stuff for the product to have its minor version incremented to 5! IMF Tune v2.5 is a free update for all v2.0 users and is planned for final release later this month. V2.5 includes whitelisting, blacklisting, improved Exchange integration, and advanced SCL Management features. But before getting into more detail we want to thank all those who returned us feedback. As you will see many of your feature requests are included in this update. More SCL configuration levels. Under the General section you can now configure mail handling settings for any of the possible email classifications including: whitelisted, blacklisted, unprocessed and SCL0 to SCL9. Whitelisting of Senders, Recipients and email Subjects through the Whitelists configuration section. Blacklisting of Senders, Recipients and email Subjects through the Blacklists configuration section. SCL Management enabling the setup of keyword-to-SCL mappings. SCL increments/decrements add up such that if multiple matches are found than the final SCL is the net result. SCL Management has wide applicability. For example one could analyze the Received RFC822 header to implement IP filtering when Exchange is behind a relay server. We will certainly publish more details on how to capitalize on this feature. Improved Exchange Integration. 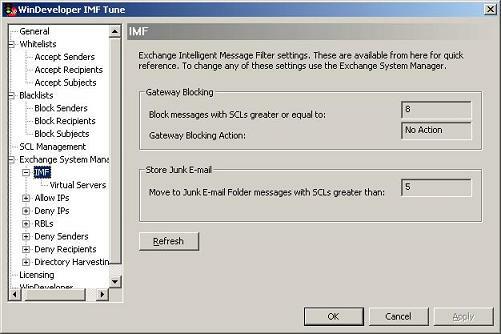 We are now exposing the various Exchange System Manager (ESM) anti-spam settings from the IMF Tune configuration. This includes the Exchange Intelligent Message Filter settings and the various Exchange 2003 out-of-the-box options for connection, sender and recipient filtering. Enable the administrator to easily visualize all the various settings being applied to the email flow. 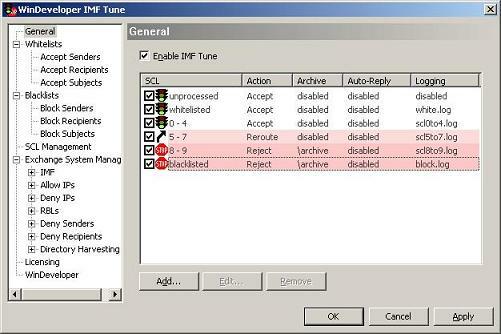 With IMF Tune you effectively have three processing layers: Exchange 2003 out-of-the-box features, IMF and IMF Tune. Bringing all settings together can highly simplify visualizing how the various settings will effect the system overall. Increase the awareness of Exchange 2003 out-of-the-box functionality. The configuration was not saving UI changes such as the column widths for the list control under the General section. The configuration was not tracking properly the last configured archive directory and logging directory. This was causing unnecessary browsing when configuring archiving and logging for multiple SCL levels. Whitelisting SCL level was never functional. 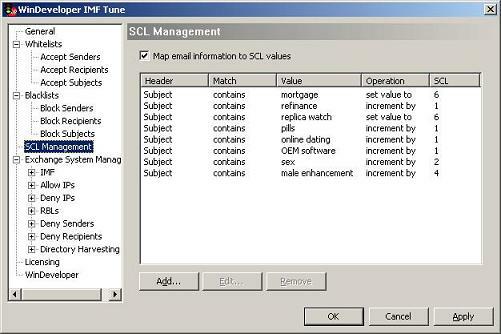 With the latest IMF Tune v2.0 you could configure an SCL configuration level for whitelisted emails. In effect this never did anything since none of the emails were seen as whitelisted by v2.0. The new version fixes this. V2.5 supports whitelisting and will apply the SCL configuration appropriately.